P.S:- Anandapur, Kolkata- 700 107. 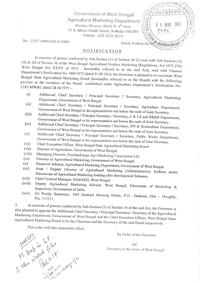 • Additional Chief Secretary / Principal Secretary / Secretary, Agricultural Marketing Department, Government of West Bengal. • Additional Chief Secretary / Principal Secretary / Secretary, Agriculture Department, Government of West Bengal or his representative not below the rank of Joint Secretary. 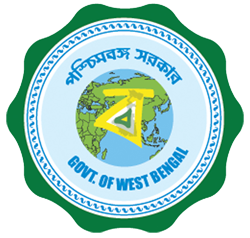 • Additional Chief Secretary/Principal Secretary/Secretary, L & LR and RR&R Department, Government of West Bengal or his representative not below the rank of Joint Secretary. • Additional Chief Secretary/Principal Secretary/Secretary, FPI & Horticulture Department, Government of West Bengal or his representative not below the rank of Joint Secretary. • Additional Chief Secretary/Principal Secretary/Secretary, Public Works Department, Government of West Bengal or his representative not below the rank of Joint Secretary. • Chief Executive Officer, West Bengal Agricultural State Marketing Board. • Director of Agriculture, Government of West Bengal. • Managing Director, Paschimbanga Agri Marketing Corporation Ltd.
• Director of Agricultural Marketing,Government of West Bengal. • Financial Advisor, Agricultural Marketing Department, Government of West Bengal . • Joint/Deputy Director of Agriculture Marketing (Administrative), Kolkata under Directorate of Agricultural Marketing looking after development schemes. • Chief General Manager - N A B A R D, West Bengal . • Sri Pradip Banerjee, 10/4, Dankuni Housing Estate, P.O:-Dankuni,Dist. :- Hooghly, Pin:-712311 .